This Rat Sailed: How's The Boat? That is probably the big question on your minds regarding us right now. And the truth is, that is the big question on our minds as well. It has been about 3 weeks since Rover was hauled at the boatyard and so I figured I'd better bring everyone up to speed. We are still in Colorado and haven't seen the boat in person for a little while. The primary goal of this time at the boatyard was to get the bottom paint done. 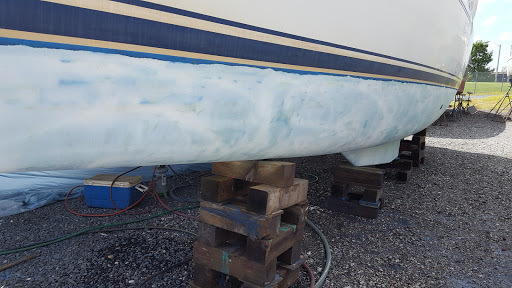 Not just a simple bottom paint, but a stripping of all the old and flaking paint followed by a new barrier coat and new anti-fouling paint. Not a fun task and one I'm OK with farming out to a yard...as long as they do a good job at a reasonable price. That wasn't the only task though. Another larger task was to have the aluminum fuel tank replaced. With a reported average lifespan of under 10 years, we figured we were living on borrowed time and had better replace it before we awoke to a bilge full of diesel. There are several other potential tasks that we could have the yard perform, but those will depend on the estimates they provide as well as the my feel for how they are doing with the current projects. Initially, the boatyard was doing well with communication on the projects. Pictures were sent from the soda blasting process and barrier coat and looked good. They seemed to be making good progress and staying on budget. Communications seem to have slowed some, but my hope is that they are doing a good job. So, they are hopefully finishing up the bottom paint and fuel tank install. They should also be preparing another estimate for another potential job. I guess I will soon see and we are keeping our fingers crossed for good results. It would be nice to know that not all boatyard are crooks. In the meantime, we are visiting with family and friends and eating out too much...but it has been a nice visit. Perhaps "no news is good news" when it comes to the work being done on your boat by this boatyard. Glad to see they sent you some work in progress pics early on. I'm surprised at the 10 yr life for alum diesel fuel tank- now E10 gas attracting water is another thing. Assume your old tank was well supported and not foamed-in. Did you go with another alum tank or switch to plastic? Hope the rest of your Colorado vacation is going well. Trip has been good. Jury is still out on the yard, but it looks like they will be unable to do at least one task. The new tank (pictured) is plastic. Aluminum doesn't like salt water any more than most other metals...and there is nowhere on a boat that can hide from salt water all the time. 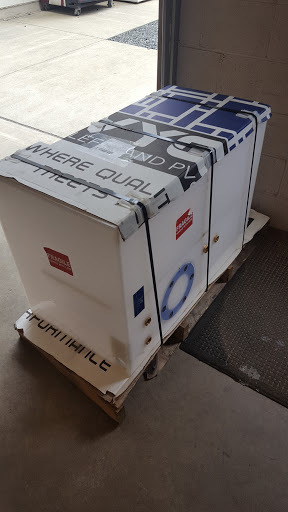 I had an aluminum tank on a racing boat, it lasted 13 years before it developed a leak. The hole just looked like one of the hundreds of other salt spots over the tank. I took it to get repaired but was advised it was not worth repairing. They cut the end of the tank to show me, and sure enough there was 20+ similar looking spots on the inside (the other spots just hadn't started to leak). Looking at the tank, none of the spots looked anything serious. I had another aluminum tank built as it was an unusual shape and time pressure to get back out racing (excitement in my youth). I think the plastic tank is a much better option. Yep, exactly. Figured 17 years was really pushing our luck and I wanted something less corrosion impacted. The plastic walls are thicker so we lose a tiny amount of capacity, but we'll worth it in my opinion.